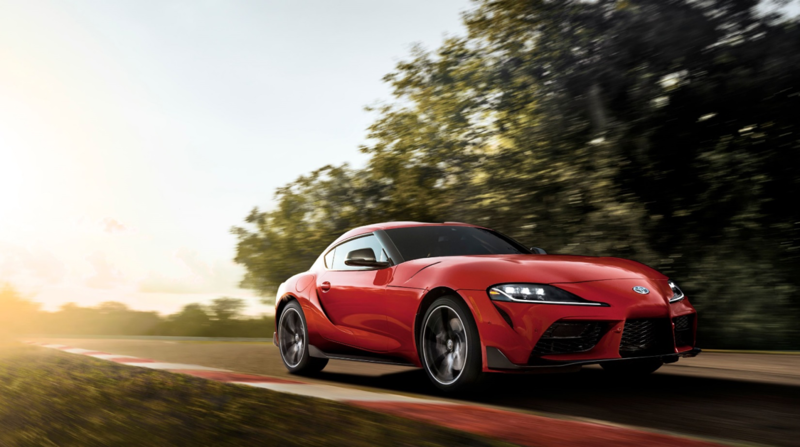 In perhaps once of the worst kept “secrets” in the automotive industry, the 2020 Toyota supra made it’s first official, undisguised reveal recently at the North American Autoshow in Detroit. This is the first new Supra in North America in 21 years and is the 5th generation (or Mk V/A90 for Supra fans) of the Supra but promises to be everything but nothing like its predecessors. The new Supra is being classed as a premium GT vehicle, balancing sporty performance and function with premium comfort and convenience features. Keyless Smart Entry, dual automatic climate control, auto dimming rearview mirrors, rain sensing wipers, power folding mirrors and a leather wrapped steering wheel are all standard features. Safety features such as a pre-collision system with pedestrian detection, lane departure alert with steer assist, auto high beam and full speed radar cruise control will be standard and also enhanced with other available active safety features such as blind spot monitor system and rear cross traffic alert. Inside, the Supra will also have an 8.8”touchscreen display with navigation, rotary touch controller, Supra Connect telematics Apple Carplay and a 12 speaker JBL sound system. The dash is an HD colour display that projects a large diameter, 3D dial that floats information over it such as a tachometer and shift timing indicator as well as a HUD that allows the driver to easily focus on driving this performance machine. The new Supra is powered by a 3.0L twin-scroll turbo inline 6 cylinder engine producing 335 HP and 365 lb-ft of torque mated to an 8 speed automatic transmission with paddle shifters allowing for a 0-96km/h time of just 4.1 seconds. But the engine is only part of the story. 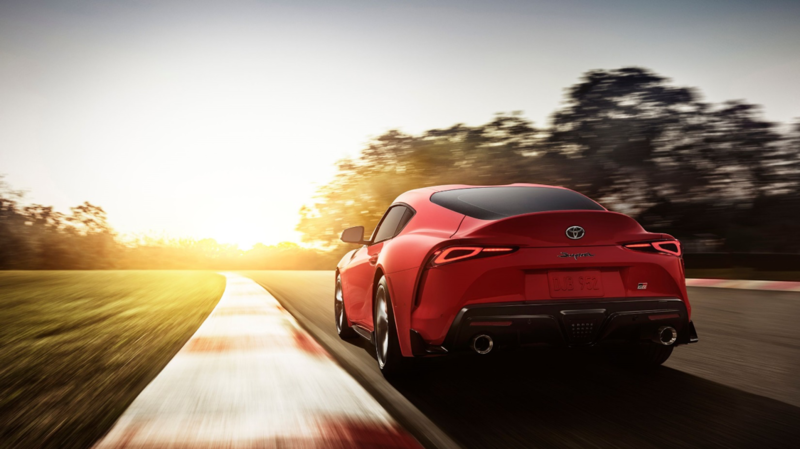 The whole vehicle was designed with a performance attitude and involved Toyota President and master driver Akio Toyoda testing the Supra on the Nurburgring and other racing venues to make sure this Supra exceeds everyone’s performance expectations of the Supra. Toyota also involved Gazoo Racing when developing the Supra. The goal was to have a low centre of gravity, high structural rigidity and a 50:50 weight distribution. Great care was taken in designing the precise and rigid Adaptive variable suspension mount points and tuning allowing for precise wheel and handling control. Other features, such as an active differential that precisely controls torque distribution between the rear wheels and and variable sport-tuned variable electric steering ensures that all that power meets the road. Obviously designed after the FT-1 concept car from years ago, much care was taken in the design to even further enhance the comfort and performance of the vehicle. Such details as the “double-bubble” roof reduces drag by shaving the roof centre but allows for significant occupant headroom. The front was inspired by both the former Supra and also the FT-1 with prominent central grill flanked by large intakes on either side. In the rear, the prominent rear integrated spoiler pays homage to the mk 4 Supra wing plus suppresses aerodynamic lift. The Supra is expected to be “available” for sale in the summer of 2019, however, it is not known at this time the intended price range nor the availability, but rumours are that will be in the $60000-70000 range and very limited at that. I’m hoping that these rumours prove to be untrue, especially on the availability, though some “rarity” is a good thing.